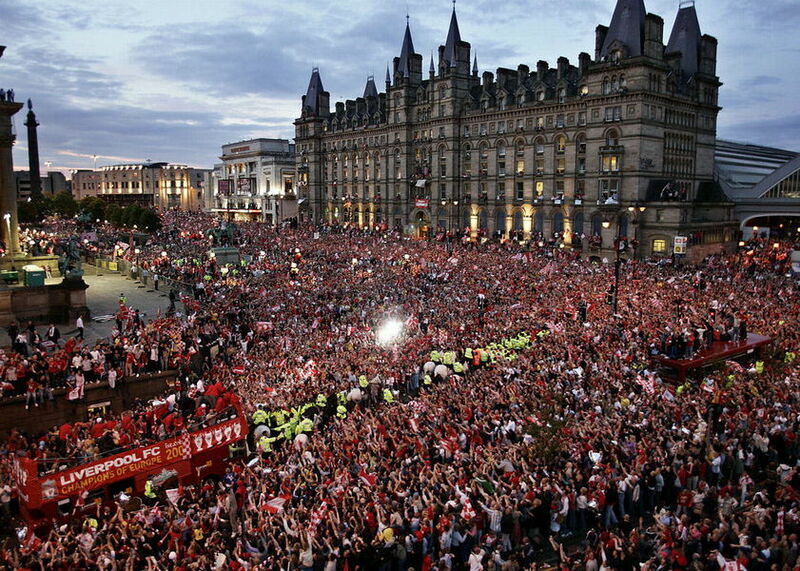 Originally published by me on http://www.thisisanfield.com Nine years on and 2005 is about far more than Istanbul for me. With all great stories it’s always more about the journey than the destination. As far as I am concerned it all started in that game against Olympiakos. This was a game that, had the final not played out the way it did, would have been rightly been described as a miracle. The fact it is now overshadowed by what happened in the Ataturk Stadium tells you just how special that Champions League run was. We went into that game fully expecting to be in the Europa League by full time. Stevie himself had been mildly rebuked by Rafa earlier for saying we couldn’t go on and win the competition. None of us disagreed with him though. At half time things couldn’t have been worse. We needed to win by two clear goals, and the Greeks were a goal up from a belter by Rivaldo. We now needed three goals in the second half. Impossible surely. The atmosphere inside the ground after the interval has faded from most peoples memories now. Not mine. I was in the Anfield Road end, and the singing was continuous from our lot and theirs. The whole place was bouncing. As the ball arrived at Gerrard’s boot, from Mellor’s header time stood still. I never got to hear Andy Gray scream “You beauty!” until much later, but who could disagree with the sentiment. The Greeks were silent we were jubilant. That was the first miracle of Istanbul out of the way. The ground seemed to take an age to empty, and my abiding memory is of George Sephton declaring it the greatest atmosphere he had ever witnessed. Now that’s some statement. I was just carried away and immediately broke my golden rule of never betting on the reds. Leverkeusen and Juve seemed to pass me by. Looking back it seems like they were just a footnote. That said, a very tense lager fuelled night in the Blue Anchor watching the second leg tells a different story. So it was on to the semi against Chelsea. I can barely remember the first leg at Stamford Bridge. I think Lampard went close at one point but that’s about it. The rest is a blur. I got a ticket for the return leg in the Kop. The ground was filling up long before kick off, and we could hear the songs as we walked through the turnstiles. I remember us joining in as we presented our tickets and climbed the steps to our seats. By the time kick off arrived the pressure in my head and churning in my stomach had reached unbearable levels. My legs were shaking, and my throat already raw. How would I get through 90 odd minutes? Of course we are Liverpool and, as we proved with Olympiakos if we are going to do something at all, we’ll do it the hard way. So it proved to be. I have to admit for me Garcia’s delicate chip didn’t look a goal from my perspective (not that it matters one bit). For several seconds I was actually unsure what had happened. The players were going mental, and it seemed to take a while before the people in my section cottoned on to the fact we had scored. What followed can be best described as brief pandemonium followed by an eternity of nerve shredding tension. I still don’t know how my heart kept going throughout the 95 minutes that followed. I have no idea how I kept my tea and pre match beer down when the ball fell to Eidur Gudjhonsen. It seemed harder to miss, but he did. Chalk off the second miracle. There then followed a taxi ride to the Hare and Hounds in West Derby Village. We had a Turkish Odyssey to plan. Well my mates did. To my eternal shame I listened to the wife. There had been trouble in Turkey before, with Leeds fans stabbed. She persuaded me it would be too risky, so I agreed not to go. The fact we are still married now may well be the third miracle. I got a measure of revenge in that the final took place on our anniversary. I should mention now that she is a blue, and seeing the lads pull off one of the greatest fight backs of all time whilst being largely ignored by me couldn’t have sat well. The fact that I went through all the champagne probably didn’t help much either. At half time I was inconsolable, not that she was trying too hard to console me. Like everyone else I feared a real mauling. This could have been an embarrassment of epic proportions. I went outside for some fresh air, and to clear my head. The banners and poster in the neighbours windows were mocking me. Sulking men and women were standing on the door steps, some smoking others looked to be in tears. I looked up at the sky. I don’t know why. I am not in the least bit religious. By full-time I was definitely feeling the rapture though. I had a decision to make, just like the Reds in the Ataturk. Did I really want to watch the rest of this? I took a deep breath and told my self to get a grip. The boys had taken us this far. Nobody, me included gave them a chance at the start of the season. They had already pulled of enough miracles for several seasons. The least I could do was stick with them come what may. So I went back in, opened another bottle of bubbly and settled in for rest of the game. By the time Xabi put in the penalty, after Dida had given me a heart attack I was crying my eyes out. They were uncontrollable tears of joy. The wife had retired to the kitchen to clear away my uneaten anniversary dinner. She came running in and on seeing the score just stood open-mouthed, before saying “You’re kidding me?” She sat and watched the rest of the game with me, and willing us on. That’s not quite a miracle but it’s close. Extra time and penalties didn’t phase me one bit that night. I had already agreed with Andy Gray who when Dudek pulled off the fourth miracle, said you might as well start carving Liverpool’s name on this cup. I had no doubt we would end up with the cup, it seemed written in the stars. Then came miracle number five, the cup was ours to keep. Funnily enough though, when I reflect on that incredible season, it’s not the five amazing miracles I remember most. It’s not returning all of my blue mates texts at full-time that gives me the most pleasure. Nor is it the unbridled joy I felt the following morning as I bought every newspaper in the shop (except one of course). For me my abiding and most pleasurable memory was standing outside the Jolly Miller on Queens Drive with my daughters and son to welcome the team home. My kids had been too young to fully appreciate Houllier’s treble winning season in 2001. Seeing their excitement as the bus went by, hearing them shout and cheer brought fresh tears. I had seen it all. To them this was new. A new generation baptised in glory. That was the sixth miracle of Istanbul.